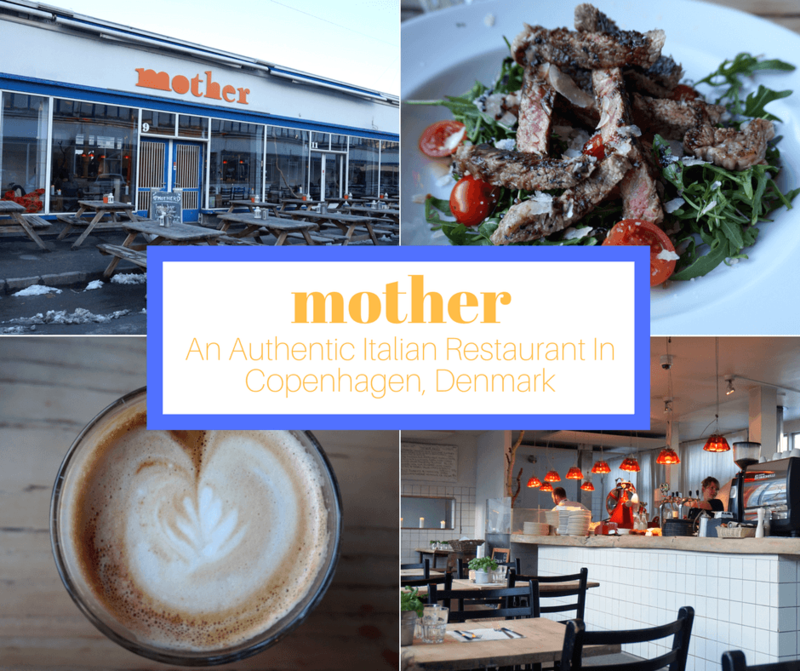 If you’re wondering where to eat in Copenhagen, we highly recommend “mother.” This Italian restaurant in the old meatpacking district is famous for its wood-fired Napoli style pizza, as well as other great food and wine options. Open since 2010, mother quickly grew in popularity. The restaurant believes in fresh and authentic food, so they import a lot of their ingredients directly from Italy and they make their own mozzarella from organic local milk. She quickly responded, “mother” and showed us on our map how to get there. It took us just over 10 minutes to walk there, and we liked the atmosphere as soon as we walked in. We were greeted with smiles and the decor was simple and rustic with a lot of wooden accents. Normally, we’d be all over the pizza. Especially since mother is considered to have some of the best, if not the best, pizza in Copenhagen. But we wanted to do things differently this trip and try new things. So instead we ordered deep-fried risotto balls as an appetizer, and the grilled veal as our main course. We liked the contrast of the crunchy outside and soft inside of the risotto balls. And the grilled veal… it ended up being the best thing we ate during our time in Copenhagen. The veal was cooked perfectly; juicy and tender. And the balsamic, parmesan cheese, cherry tomatoes, and arugula complemented the veal magnificently. For dessert we had coffee and a calzone. The calzone doesn’t look like much from the outside, but inside it’s filled with ricotta cheese and nutella. It was amazing. We would like to point out that we were in no way compensated or offered a discount by the restaurant. In fact, we made no mention of the fact that we have a blog. We just really enjoyed the food, service, and atmosphere and wanted to let you all know about it so that if you’re traveling to Copenhagen you know of at least one place to go to for great food. Asking locals for recommendations is my favorite way to find the best food. This place is gorgeous, too! I love the firewood wall. I wonder why they didn’t use the Italian word for mother: madre. The word connotes so much good caring, especially at the kitchen where she prepares great meals! Calzone with Nutella – wow! I would have never figured! A dessert dish that I definitely want to try! I never expected it before I went but Copenhagen is full of so many amazing restaurants. I found loads when I went and have heard about a few others since. I’m adding this to the list of places i’m gonna have to check out when I go back. Thanks for the recommendation, love my Italian food! Hi Claire! Yes, Copenhagen is becoming quite the foodie city! It s a joy to eat here and if you like it, then they have another couple of Italian restaurants in Copenhagen but that is for another list.